Jewish Museum of Maryland collaborates with Everyman Theater to reveal extraordinary true story behind new dramatic work. 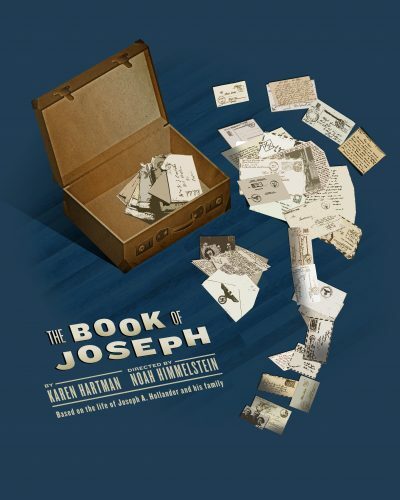 This spring Everyman Theater will premiere a new play, The Book of Joseph, based on a memoir of Baltimorean Richard Hollander, Every Day Lasts a Year: A Jewish Family’s Correspondence from Poland. Working with both the production company and the author, the Jewish Museum of Maryland has created a companion exhibit featuring original Hollander family letters and artifacts central to the story of the play. A chance discovery of a suitcase in an attic filled with letters written in a foreign language and stamped with swastikas led Richard Hollander on a journey to uncover his family’s history. Unbeknownst to Richard, while his father had fled Poland prior to World War II, the rest of his family was trapped. The letters, written in German and Polish, document the increasing danger that the family faced as they struggled to stay together and to find refuge in another country. They also shed light on his father’s difficult experiences gaining asylum in the US once he arrived in New York. The extensive correspondence that he unearthed tell a remarkable – and ultimately tragic – story of one family’s resilience and love for one another set against the turbulent backdrop of the Holocaust and World War II. Join us on April 26, 2018 at 7:00pm for a special Inside Look LIVE event! For bonus material in addition to the exhibit, check out our exhibit page here.